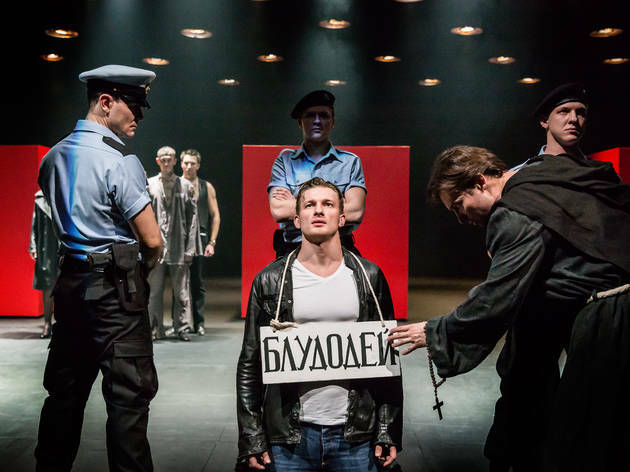 When Declan Donnellan's Measure for Measure premiered in Moscow a little over three years ago, it was hailed by Russia’s leading independent newspaper, Novaya gazeta, as “a shattering portrait of contemporary Russia”. But Donnellan, a British theatre-maker (and co-founder of the award-winning company Cheek by Jowl) says the production has plenty to say about the contemporary Western world as well, especially given recent events. As The Guardian’s Lyn Gardner wrote in 2015, the show is “set in a shadowy place that could very well be Putin’s Russia, but might be any other country where authority is misused.” Is this the perfect production for a post-Trump, post-Brexit world? Donnellan is in Sydney this week for the production’s Australian premiere at Sydney Festival. 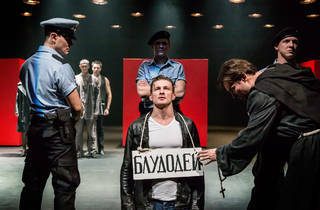 The Russian-language co-production between Cheek by Jowl and Moscow’s Pushkin Theatre is certain to make an impression. Mir24 described it as “a real thriller, piercing the heart of the entire audience". In the words of Nezavisimaya gazeta: "From every point of view this production is a total success". But what compelled the renowned theatre-maker to take the Bard to Russia in the first place? That isn’t a problem here: naturalism gives way to an abstract, almost Kafkaesque shadow world, playing out on a stage that’s empty but for five red containers and an ever-present ensemble, and that’s characterised by a pervasive air of near-constant surveillance. Is this where the 21st Century is going? And if it is, what does Shakespeare – who last year marked the 400th anniversary of his death – have to say about it? "I think it is how we are made. The ancient Greeks went back to Homeric times of thousands of years before them to talk about their political realities. Sometimes you have to go away to see. If you hug someone too close you cannot see them. Time and distance are obstacles, but we need obstacles to become close. Which is why the greatest love scene in the world has three characters, two young Italians and an ever present balcony. It is the balcony that makes them close. Art and theatre in particular are crucial to politics. Politics is not about screaming slogans, politics is the discussion in the forum of people who have different points of view. On social media we can trawl to find people who seem to be just like us, people with whom we have sympathy. Sympathy is dangerous; if I like her only because she is ‘just like me’, what do I do with someone who is not like me? If we get addicted to only having frictionless encounters with carefully selected people we are retreating from the reality of life and retreating also from the world of discussion, the world of politics. Empathy is different from sympathy. With empathy we can stand with someone who is not like us. We can respect someone who does not agree with us. Empathy is the basis of political discussion. Whereas pure sympathy leads to war. We have to wean ourselves of a world of sympathy and into a world of empathy. In theatre we see people who are not the same as us, feeling things that are not necessarily what we feel, doing things that we probably would not do. And yet we connect. We connect in empathy. Theatre teaches us, helps us to live in a world of difference. The only world is a world of difference. A world without difference is a consoling illusion that sells products to consumers. All of Shakespeare’s plays help us to be with people who are not necessarily like us. I cannot imagine anything more politically useful at this present moment. Brexit is very serious. The English have a brilliant capacity to hide their fanaticism. When it erupts it is brief and deadly and then disappears fast under a miasma of thatch and royalty and warm beer. We have just glimpsed that happen once again. All the talk is about calm and continuity, and we never have a revolution - only foreigners do that. During the First World War, one of the combatants faced a mutiny from the army which made the government back down, which led the army to open fire on civilians in a capital city. This resulted in a civil war, which the combatant lost and led to the loss of 20 percent of the national territory. That country was the United Kingdom, yet such is our astonishing command of spin that we managed to fool all the other combatants that we sailed out of the conflagration as the model of constitutional continuity. One of the causes of Brexit is nostalgia, which is always angry. And amnesia. One of the many reasons for the EU’s foundation was to stop another European War. Last year, in both the UK and the US, politicians lied to the voters. But in both countries many people knew they were lies. And some voted for the guy who told the lies they wanted to hear. Politicians and priests cannot always tell the truth, It is often far too politically incorrect. For example both left and right portray the people as being fundamentally innocent, if misled by other evil leaders. In theatre we do not and must never tell the truth. We create an illusion, and admit that it is an illusion, and ask an audience to investigate that illusion with us. And it helps us to feel and to consider and perhaps even to develop some empathy. Both votes in the US and the UK had things in common. Not least the utter surprise felt by so many on the left at each result. A significant factor is that in both cases some people were clearly voting against their best economic interest. Both votes were only possible because all humans have a desire to destroy which no politician dare discuss. Thank you, loony Kaiser. The mad can help us see things which we are too sane to admit to ourselves. He recognised we like to destroy what the other has but we have not. Only by seeing these things in ourselves can we make sure not to act on them. Theatre and art are places where we can safely investigate dangerous spaces which are politically unsayable, and consequently politically dangerous." Matthew has worked as a freelance foreign correspondent in more than 15 countries (including Russia), specialising in first-person narrative journalism, political commentary and travel writing. His journalism has appeared in The Australian, The Sydney Morning Herald, The Saturday Paper, The Guardian Australia, The Monthly, The Spectator Australia, World Affairs Journal, and more.